Space week is one of my favourite weeks of the year. 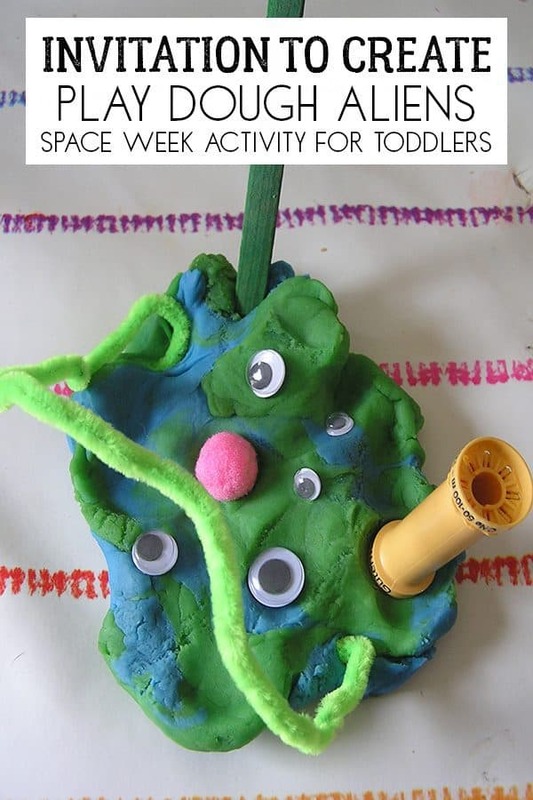 We love creating, playing and exploring with the theme of outer space and this simple Space Activity for toddlers to create some Playdough Aliens is quick and easy to set up and lets your little ones explore the theme. Scroll down to find some great Alien books that you and your little ones can read together to get inspiration for what their aliens may look like. We have included links to the materials we used as well as recommended books. If you buy via these links we may earn a small commission. Initially, we started with fairly small Aliens as you can see from above but they got bigger and bigger as the morning went on. This open-ended creation is fantastic for imagination – as J was creating he was describing what the alien would be like and do. T was making marks with the different bits in the playdough and playing with them moving them around the table and into the other room. Our biggest Alien is above, apparently, it creeps and crawls it’s got lots of eyes to see behind it and around and around as it spins. The Cotton reel makes it easier to hear as that it’s mouth with lots of spiky teeth on it. By far our favourite alien book is Aliens Love Underpants by Claire Freedman and Ben Cort. The whole series of books featuring underpants were read time and time again. The kids loved the silly characters and rhymes and I loved the illustrations and making them laugh. Following a similar storyline to The Three Little Pigs, The Three Little Aliens and the Big Bad Robot by Margret McNamara is a fun read for you and your toddler. It’s a great idea to read books like this which follow the story of classic children’s tales and switch them up as your little one will see similarities between them. When the aliens start eating the Astronaughts boots they get fed up and head off back home… but that brings a surprise visitor to the planet where the aliens live in Aliens Love Astronauts by Melinda Kinsman. In this fun rhyming book ,you and your toddler will laugh at the antics of the silly creatures. 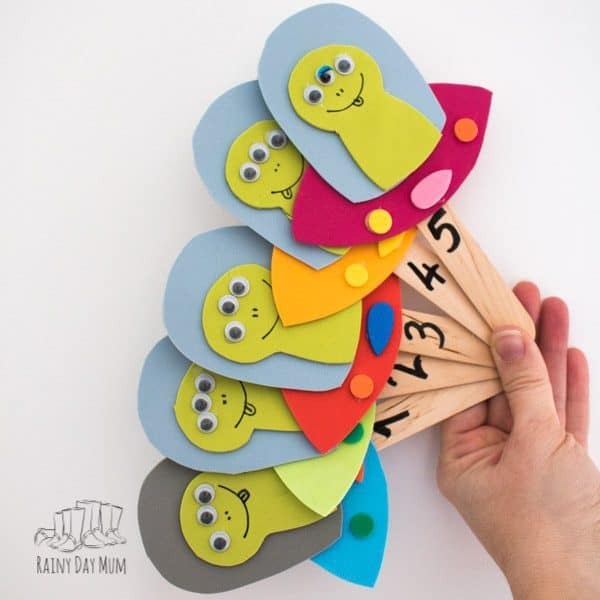 Make these Five Little “Aliens” in their Flying Saucers and sing along to this popular counting rhyme with your toddler. Make an easy Alien out of a Paper Plate like this idea from Glued to my Crafts. 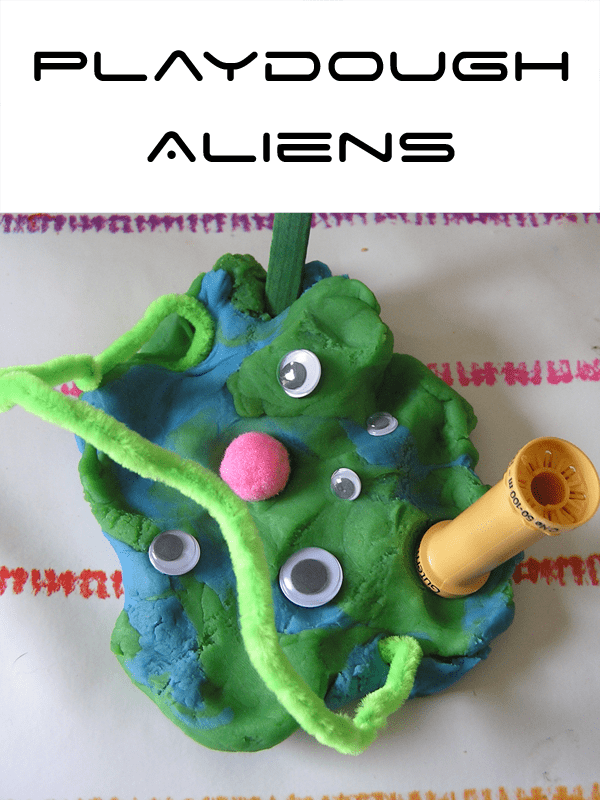 This Alien Sensory Bag from Claire’s Little Tots is ideal for a mess-free sensory activity and perfect to go along with our alien play dough creations. Stir the Wonder has a fantastic Alien Planet Fizzy Sensory Bin I love this combination of science and sensory play and would set this up on a wipe clean mat or outside to minimise the mess made by your toddlers and preschoolers. I love your play doh Cerys! What a wonderful alien. Why don’t you write down J story about him? I love all of his eyes! What a wonderful creation! Your materials made perfect aliens! Love them. 🙂 Thanks for sharing at the Sunday Showcase. I really loved the usual information an individual provide in your visitors?